All Sweeper is a family business that is 100% Australian owned and operated. We are the only road sweeping company with ISO Certification for Quality, Environmental and OH&S. We are committed to providing exceptional customer service at a very competitive price. 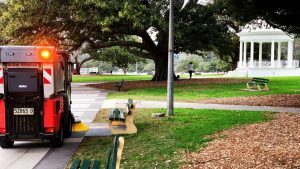 Established in 1980, All Sweeper now operates the largest mechanical road sweeping and street & on-site scrubbing business in Sydney. With a modern fleet of over 20 reliable road sweepers and highly trained and competent operators, the company has undertaken many major projects for large construction, industrial and commercial organisations, councils and government departments. We’ve earned a reputation for exceptional service based on our ability to respond quickly to customers’ needs, provide resources, and ensure that the project is completed on time and within budget. Our guarantee of 100% uptime for all equipment or swap it out means there is never a loss in daily production. At All Sweeper, we use a Satellite Tracking System to manage our street sweeping vehicles and footpath sweepers. This allows us to locate the nearest vehicle and respond promptly to customers’ needs, and assists with early and late starts. We have the flexibility, capability and resources to meet the growing demands of a diverse customer base. We pride ourselves on exceeding our customers’ expectations by supplying modern, reliable sweepers and scrubbers with professionally trained operators. This certification ensures that we manage our environmental responsibilities. Ensures the highest standards in safety, reliability and compliance.